Thomas J. Madigan graduated from the University of New Haven in 1986 with a Bachelor of Science Degree in Arson Investigation, a Minor in Criminal Justice and Certificate in Fire Prevention. He immediately put his education to work as a fire origin and cause investigator in the private sector and as a firefighter in the public sector. 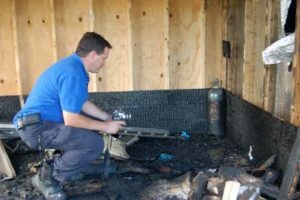 Tom has more than twenty-four years of experience in the investigation of fires as a private investigator, as well as within the fire service in the Commonwealth of Massachusetts. He is an experienced expert witness in the determination of fire origin and cause. He holds the designation of Certified Fire Investigator from the International Association of Arson Investigators and is certified by the Connecticut Department of Public Safety as a Fire Marshal, Fire Investigator, Fire Code Inspector and Hazardous Materials Inspector. In addition to his degree in Arson Investigation from the University of New Haven, Tom has continuing education in fire investigation from the National Fire Academy, Bureau of Alcohol, Tobacco and Firearms, Massachusetts Office of the Attorney General, Saint Anslems College, University of Delaware, Rutgers University, the Massachusetts Fire Academy, the Rhode Island Fire Marshal’s Office, the Connecticut Bureau of State Fire Marshal and additional public and private educational sources. He is a member of the Connecticut and Massachusetts Chapters of the IAAI, as well as a member of the Professional Firefighters of Massachusetts. He has taught at the Massachusetts Fire Academy and is a Certified Fire Instructor. He is also a Lieutenant with the Braintree Fire Department. Tom joined Acacia Investigations in 2010. He is very well respected in the field of fire investigation and his helpful and cheerful personality makes it a pleasure to work with him. His fire service, fire investigation and insurance industry experience make him a tremendous asset to our team.